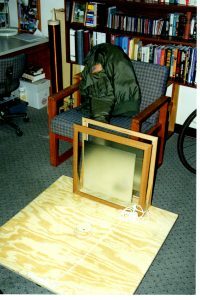 I had the opportunity to build a Tesla Coil for Electromagnetics II at the Air Force Academy. 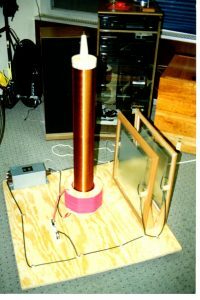 The primary coil was wound around a wooden frame that I built. 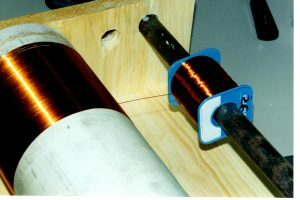 I wound the secondary coil around a PVC pipe with coated copper wire. Somehow I was able to get a neon sign transformer to feed the circuit. The spark gap was just two bolts with their ends filed down to points. 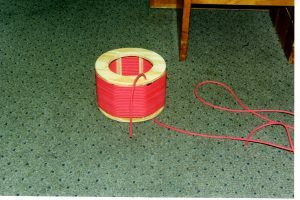 The emitter was just a coathanger soldiered to the end of the secondary coil.